An organic farmer with over 40 years of experience, he is a trained naturalist and a docent for the San Elijo Lagoon Conservancy in California. He teaches the Master Composters Training Course, Gardening and Composting classes and workshops on Integrated Waste Management, sustainable food systems and permaculture design. Planted and managed avocado and citrus groves in California for over 35 years. Perusing organic and sustainable farming methods in the 1990s, he owns and operates Organic Grove and Garden Service designing and installing organic vegetable gardens, family fruit orchards, edible and native plant landscapes. He is currently working on projects in Europe, India, and the U.S.
One of his specialties is designing and building organic waste recycling systems, in the U.S., Europe and India where he has opened three institutional food waste composting facilities turning waste into valuable resource. He loves teaching children and families to become more sustainable at home and in their daily lives. 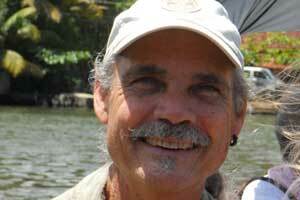 His passion for preserving and restoring degraded ecosystems is reflected in all his work. Organics Recycling, and Sustainable Agriculture. Edible & Native Plant Landscapes. management company maintaining approximately 500 acres for 35 customers. Designed and installed irrigation systems, planted trees, managed harvests and inventories. Hired and supervised work force. citrus grove. Planned, designed and planted undeveloped land including irrigation systems, roads, grove layout. Hired and supervised work force, purchased and maintained inventories. Gitamritam speaker in the year 2013.